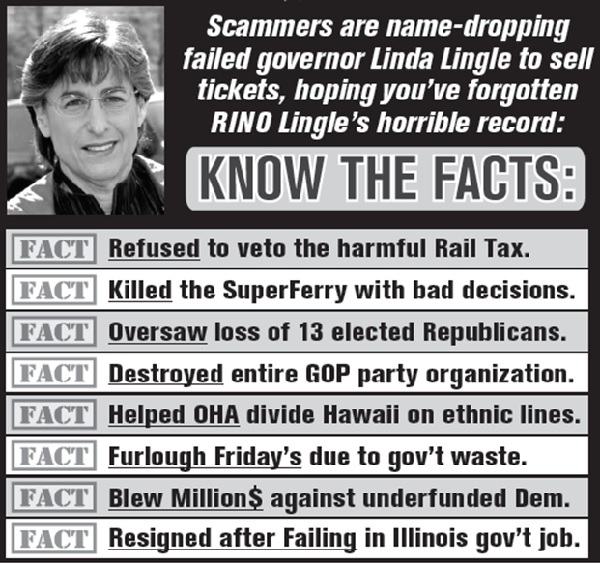 On Monday, HIRA reminded you about one aspect of Linda Lingle's harmful legacy -- her instrumental role in forcing the massive rail tax down everyone's throats after insincerely promising Republicans that she would fight tax increases; even after having signed the Taxpayer Protection Pledge . Instead, Lingle chose to partner with Mufi Hannemann, the Rail Consortium and the Democrat Party to fleece taxpayers ad infinitum. Yet you'd be amazed at the number of Republicans who either forgot or never knew that Lingle betrayed taxpayers; personally costing them $300 million per year on the rail tax alone . . . a tax which Lingle's Democrat (and RINO) buddies are poised in 2017 to make permanent. How un-Republican!! Well, party leaders Miriam Hellreich and Fritz Rohlfing plan to completely dishonor Trump's election by inviting this very same Linda Lingle to be the keynote speaker at a fake 'pre-inaugural' event in honor of Trump . . . which is merely a deceptive fundraiser for the beleaguered, RINO-controlled organization that is currently targeting unsuspecting Trump voters in Hawaii for their money. SO MUCH MORE TO THE STORY: RINO Lingle's sorry legacy does NOT end with the destructive and costly rail tax. There's so much more. Lingle opposes so many of the VERY positions which could have set the GOP in Hawaii apart from the ruling Democrats and paved the way for Republican candidates statewide. Here are just a few of the other major issues where former governor Lingle slapped Republicans and all Hawaii residents in the face, over and over and over. Yes, the Lingle administration killed off the SuperFerry before the first passenger or automobile ever boarded the vessel by recklessly attempting to circumvent the State of Hawaii's environmental requirements for an environmental assessment. Mishandling of the approval process for this desperately needed service by Lingle allowed radical activists to hijack and sink the ferry operation over Lingle's poor judgement and missteps. Not even a special session of the state legislature could pull Lingle's okole out of the fire and save the interisland ferry service. Arguably, the Hawaii Superferry would still be sailing today -- connecting the major islands of Hawaii -- and providing competition with the airlines if the Lingle/Aiona administration had not botched everything. Watch this 2-part documentary if you don't believe it. PART ONE . PART TWO . 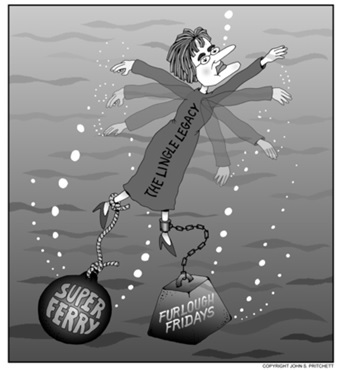 Lingle sunk the SuperFerry by acting like a bigshot and refusing to do an EIS. It's that simple. The tragic history of this failure by Lingle is crystal clear. All Republicans know that competition is the American Way. It's what drives down prices along with keeping down the overall cost of living. Well, Hawaii Democrats won't bite the hand that feeds them, especially when that hand belongs to a politically generous local monopoly like Matson Shipping. That's why the entire Democrat (and subservient RINO) political machine of Hawaii stands in support of Matson and stands against allowing global competition to bring goods to (and from) Hawaii more cheaply. With Matson's financial contributions to puppet politicians, these puppets can easily afford to keep winning re-election while ignoring the pain to voters caused by the high cost of living. 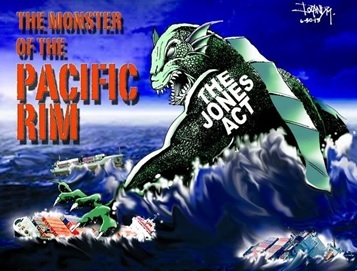 So, when Republicans finally got one of their own GOP members elected governor (Linda Lingle) in the most expensive and remote state to live, it was hoped that we would now have a voice of reason pushing for competition in shipping to Hawaii (where more than 90% of what we consume is imported, mostly by Matson). We hoped that Lingle would actively secure an exemption to the protectionist federal law known as the "Jones Act". But no, Linda Lingle was no believer in competition and she gladly took money from Matson and its now former owner Alexander & Baldwin (A&B). As Lingle's primary election opponent (in 2002 and 2012) John Carroll said: " Linda had an opportunity to do something about this damaging law, and instead took money from A&B and Matson . . . and helped hold it in place. Lingle already sold out the Republican Party and now she's sold out every single resident of the State ." Exactly! So when the nation's economy went into the toilet thanks to the nosediving housing market, state politicians here in Hawaii were faced with a projected $1 billion budget deficit. Lingle's solution? Drastic emergency cost-cutting. However, NOT where cuts needed to be permanently made, like at state offices and agencies that nobody has ever heard of. NOT where waste is legendary, like the DOE's massive bureaucracy. NOT in the form of long-needed privatization of state services. No, she pushed to close the budget gap by closing public school classrooms 34 days over two years ; giving Hawaii the shortest school year in the nation. Educations were shortchanged and our schools became even more of a national laughingstock (on top of our low scores and low achievement). For all of her early political talk of 'reforming public schools' (which never happened), Lingle actually left the DOE worse than she found it. By failing to make the case against a bloated government with so many nonessential workers on the massive taxpayer-funded payroll (with at least half of DOE funds not even reaching the schools, instead diverted to the bureaucrats), Furlough Friday's became almost inevitable. So it's really hard to imagine that the Hawaii GOP believes it is 'honoring' Donald Trump by holding up Lingle as its Trump inauguration hero. In 2016, the Hawaii GOP endorsed Kelii Akina for the board of trustees of OHA - the Office of Hawaiian Affairs. That's the state agency which is tasked under our state constitution with improving the well-being of Native Hawaiians. 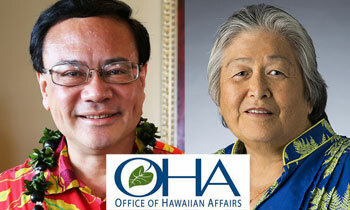 Akina successfully unseated Haunani Apoliona, OHA's longtime leader with whom Linda Lingle worked closely with over many years to screw the taxpayers of Hawaii. The plan? To push for the creation of a brand new, unprecedented government for part-Hawaiians only -- a rigged new system which would be run by Democrats, unions and other special interest groups . . . just like our existing (and costly) county and state governments. The goal? To duplicate existing departments, agencies and programs of the county, state and federal governments so that taxes would be higher, government jobs would be more plentiful, and so politically-connected developers could build like crazy on "Hawaiian lands" ripe for development; with the ownership of such protected lands transferred from the federal and state governments to this new bogus 'governing entity' for speedy exploitation by the Democrat Machine . . . with Linda Lingle's eager help. None of this had anything to do with getting Hawaiians off the beach or improving their standard of living through " federal recognition ". Even Neil Abercrombie admits the "Akaka Bill" was about land, power and money. 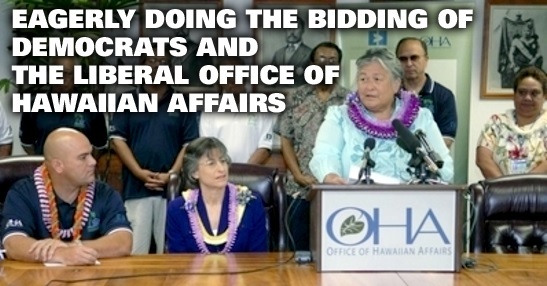 But like RINO Charles Djou, Linda Lingle believed that the key to political power was to sell her soul to the Rail Consortium, to the unions, and to OHA. The very reason Kelii Akina was supported by Republicans is because he believes the exact opposite of Lingle and the Democrats. As the head of the Grassroot Institute, Akina brings to OHA his strenuous opposition to the big government dependency culture that Lingle and Apoliona and others embrace. More importantly, Akina opposes allowing the state agency OHA (yes, it's a state agency working against us) to use taxpayer funds to lobby the government and propagandize voters in favor of creating a new bloated and expensive government for part-Hawaiians only and for the enrichment of Hawaii's political elite. 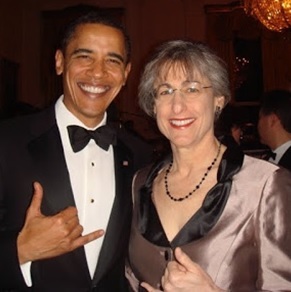 Lingle used both her office and her tentacles at the Hawaii GOP to push her racially and ethnically divisive 'dependency' agenda in tandem with the Democrat Machine and the political puppets at OHA. She wanted a "Native Hawaiian government" to take control of state and federal programs for social services that spend money collected from taxpayers nationwide . If after serving as Maui's mayor and Hawaii's governor, Lingle still doesn't realize that most money confiscated from taxpayers ends up in the pockets of bureaucrats and special interest groups (NOT 'the people'), then she is either deaf, dumb or blind. At the Cleveland RNC convention this year, Lingle had the nerve to complain that " our country is more divided than ever " without taking responsibility for her endless race-baiting alongside OHA during her years as governor and as a senate candidate. 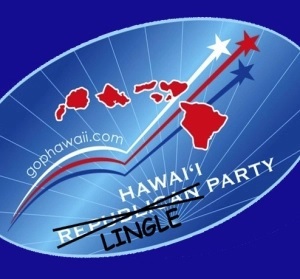 With Lingle actively trying to divide Hawaii along ethnic lines to help Democrats create even more government than we can already afford, who needs political enemies when we have Linda "Akaka Bill" Lingle, star of our state party's pre-inaugural RINO fundraiser? Who the heck is/was Randy Iwase? That's the question people were asking back in 2006. 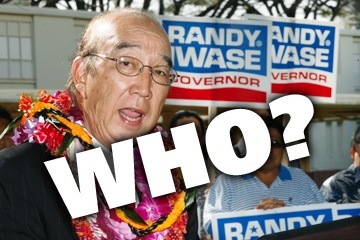 While Lingle ran for her re-election as governor that year, Randy Iwase was the nobody politician that Lingle spent multi-million$ defeating in her quest -- not just to get re-elected to a 2nd term, but -- to beat her extremely weak, underfunded and unknown Democrat challenger in every single house district statewide. Why was that so important? In order to lay the groundwork for her eventual campaign for U.S. Senate six years later . . . the campaign she lost by a nearly 2 to 1 margin to Mazie Hirono . You really gotta wonder: As the leader of Hawaii's Republican Party, why didn't these million$ of donor dollar$ find their way into "Vote Republican" TV advertising for the benefit of all GOP candidates across the state when Lingle's seat was universally recognized as "safe" ?? Why were these million$ from donors never used to make the case against Democrats who had (at that point) been in control of the state legislature for 52 long years?!? The answer is simple: It was only ever about her. She didn't care if other Republicans got elected or not. She didn't agree with Republican policies or principles. Lingle was basically an opportunistic Democrat who ran as a Republican; looking for quick electoral advancement through the ranks as a big fish in the smaller of the two political ponds. And that's why her $6.1 million campaign warchest was wastefully and needlessly aimed at beating a guy (Iwase) who barely raised a couple hundred thousand dollars . The Star-Bulletin reported that Lingle spent a fortune on paid political staff, including fellow progressive RINO Miriam Hellreich, the GOP national committeewoman for Hawaii, and also maintained a campaign office before opening her public headquarters on Kapiolani Boulevard . Well, isn't that convenient? 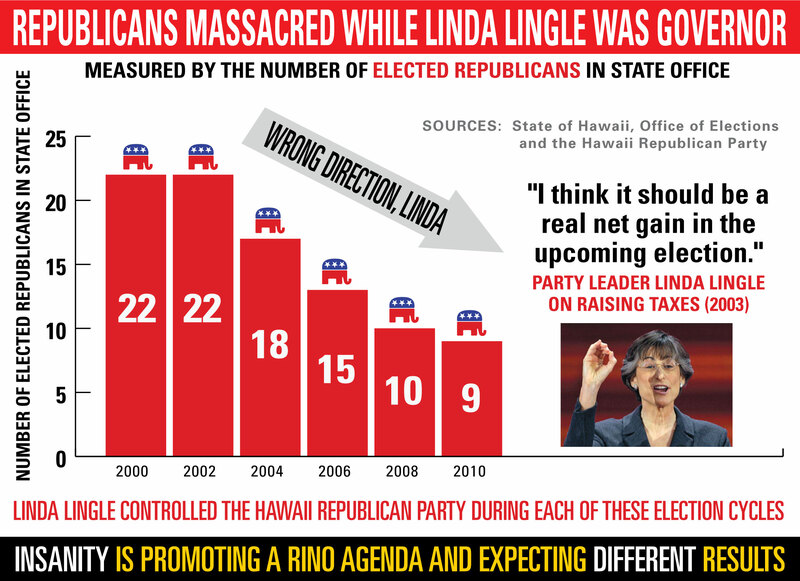 Looking back, Lingle's liberal agenda and her dismantling of the Hawaii GOP started the rapid decline of elected Republicans during her two disappointing terms in office. Since then, Lingle's RINO handmaiden Miriam Hellreich continued the trend (we're now down to just six elected Republicans). Republican Donald Trump won the White House spending half of what Democrat Hillary Clinton spent. And Trump helped deliver a Republican House and Senate. 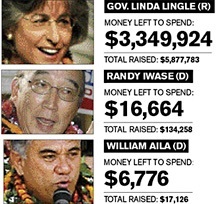 Lingle blew donor dollars at a rate many, many times what her no-name, no-chance Democrat rival Iwase spent on campaign 2006 . . . and we ended up with THIRTEEN FEWER elected Republicans in the state senate and state house when Lingle was pau. Once again, after destroying our party and overseeing massive losses (and blown millions) with Hellreich calling the shots, the idea of paying tribute to Lingle is like a slap in the face to Trump and to all Republicans. When Lingle took hold of the Hawaii GOP, our state party actually stood for specific policies and reforms. We had a much better idea what it meant to be a Republican and what voters could expect that the GOP would fix if given power. By the time Lingle and her minions led by RINO Hellreich were done neutering the Hawaii GOP, the number of elected Republicans was cut by more than half AND our party's platform was officially neutral on each and every issue. Yes, neutral. 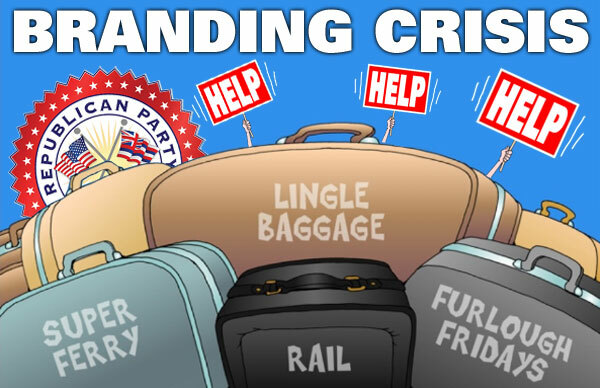 Lingle's RINO soldiers inside the state party manipulated the platform writing process every two years and decided (on your behalf) that the Hawaii GOP should stand for absolutely nothing and have no concrete solutions in our platform to Hawaii's many challenges. And on basic issues which differentiated Republicans from Democrats, progressive RINO Lingle got her way. While killing our platform, we went from being pro-life to totally indifferent; from pro-2nd Amendment to 'so what'; from tax-cutters to who cares; and so on and so on. The official answer from the Lingle GOP platform committee to the question "So, what do Republicans stand for on the issues?" is a completely blank sheet of paper. As the Honolulu Star-Advertiser put it so succinctly, Lingle no longer appears to be a superstar . Last year, unemployed Lingle got hired as a high-paid aide to Illinois' GOP Gov. 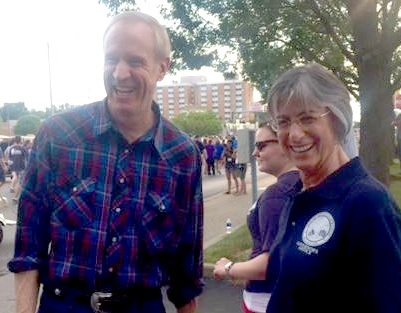 Bruce Rauner, who called her a "superstar governor" who was supposed to help him in a 'turnaround' of the state. That never happened. After just a few months on the job, Lingle resigned in disgrace this past July in an odd departure from that $200K per year job . What really happened? According to news reports, after Lingle's 'Scott Walker Lite' proposals went nowhere in the Democratic legislature, Lingle ended up mostly helping around the office with the annual Illinois state fair. Steve Brown, spokesman for Illinois' speaker of the state house Mike Madigan, said that Lingle " organized a parade for the state fair " when asked what evidence he's seen of her work in the legislature. In fact, Lingle quickly stepped down from her briefly held post just one day after Governor Rauner signed a stopgap budget without ANY of his "Turnaround Agenda" reforms which Lingle was supposed to champion, but clearly didn't. Now that Lingle has lost her mainland job under odd circumstances and Illinois' deputy governor has taken on Lingle's vague duties , Lingle seems to be back in Hawaii at the invitation of Miriam Hellreich; ready to make mischief at the very Hawaii GOP organization she sent down to the dumps during her years as party chair and then as Hawaii's self-dealing RINO governess. Lingle's upcoming event should be renamed "the Linda Lingle apology tour". Over the years, Republicans have often asked HIRA the following question: "Why does HIRA say that Lingle was a progressive who belonged in the Democrat Party?" Hopefully, by revisiting the Lingle years, that question has now been conclusively answered in this two-part newsletter . . . especially for those who don't remember and for those who never lived through the Lingle years. 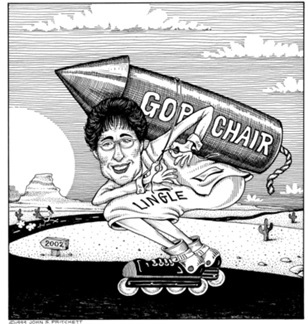 The Lingle years were completely wasted and harmed the GOP brand in Hawaii severely. Lingle, Hellreich and their RINO stooges adopted Democrat positions and kept the Hawaii GOP on the sidelines rather than fighting the big fights; sending the Hawaii GOP into a fatal tailspin which continues to this day. Voters only get the chance every two years to show if they are impressed by what they see and hear from the Hawaii Republican Party. In 2016, just like previous election cycles, our brave candidates pay the price for our party's refusal to make the case against Democrats while blowing hundreds of thousands of dollars every two years on an expensive office and related expenses. Until the party is under new management , your ticket purchases and donations to the Hawaii GOP might as well be made directly to Hillary Clinton, the DNC, and the local Ige, Caldwell, Hirono and Hanabusa campaigns. Be warned. Lingle and Hellreich prey on the weak-minded. They already have Carol Thomas of the Oahu League of RINO Women wrapped around their finger along with Al Frenzel from the Hawaii Trump campaign (and the John Carroll and Tom Berg campaigns). 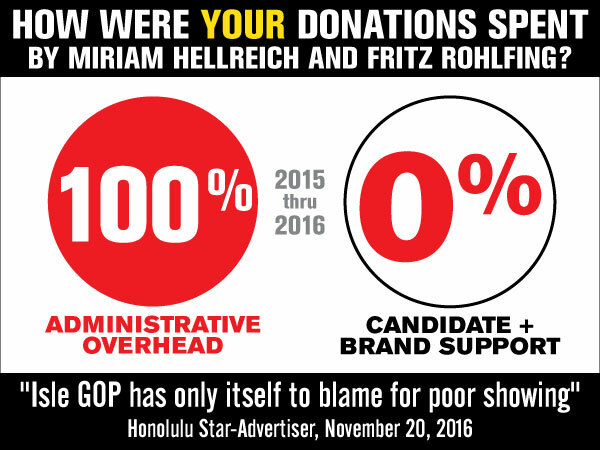 Even after Lingle destroyed the Hawaii GOP and pursued the exact opposite policies of any decent Republican (not to mention the exact opposite policies of Donald Trump), Thomas and Frenzel are actively encouraging unsuspecting folks to pay $200 per ticket to the Trump-hating Hawaii GOP so that Miriam Hellreich and her RINO gang can blow all this money on massive administrative overhead for a luxury office while ignoring issues, candidates, and elections. This is money which will never be used to help GOP candidates in the islands. History has shown time and again that these funds will only be used to help RINO's retain control of the Hawaii Republican Party while the number of elected Republicans continues to decline. Hellreich and Lingle aren't 'honoring' Trump's inauguration at all. Sign up today at www.HawaiiRepublicanAction.com to join with those who wish to take back our party in 2017 from the RINO's and closet Democrats who hold the Hawaii GOP hostage. Together, we'll take back our party, drain the swamp, and start winning elections so we can reverse failed Democrat policies. Thanks for your support for making our party better with new and serious leadership in 2017. Let's throw down the gauntlet and begin reversing our fortunes in 2018. Please join HIRA today so we can change Hawaii tomorrow. P.S. It's time to give state and local Democrats and their liberal media cheerleaders something to get upset about -- and you CAN by supporting HIRA Action with your donation of $20 or more today. Mahalo! 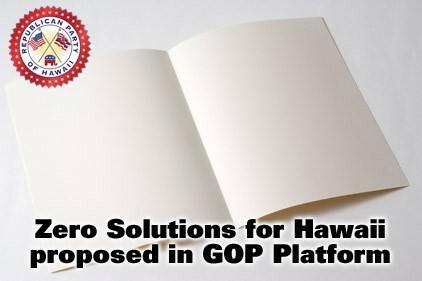 Please donate to HIRA Action, the official SuperPAC for the Hawaii Republican Assembly, to support HIRA's work to educate voters about failed Democrat policies and about conservative Republican solutions for Hawaii. Your kokua will help us continue to provide a voice for conservatives. Donate $10, $25, or $100 today to let the establishment know we're not going away.